This past Christmas we got a ton of cards. I love getting cards, especially holiday ones. And as cheesy as they are, I love the good ol’ family newsletter. Looking through all the cards, it was nice to celebrate all the new babies as well as the lives of those who passed away. It brought a smile to my face to see the little girl that was born weeks before Eli should have been born. I teared up a little when I saw a plump little Santa baby who had been wanted for so, so long and is finally here! But I never got my act together to send return cards this past December. I thought about doing New Year’s cards, but I managed to miss that opportunity as well. 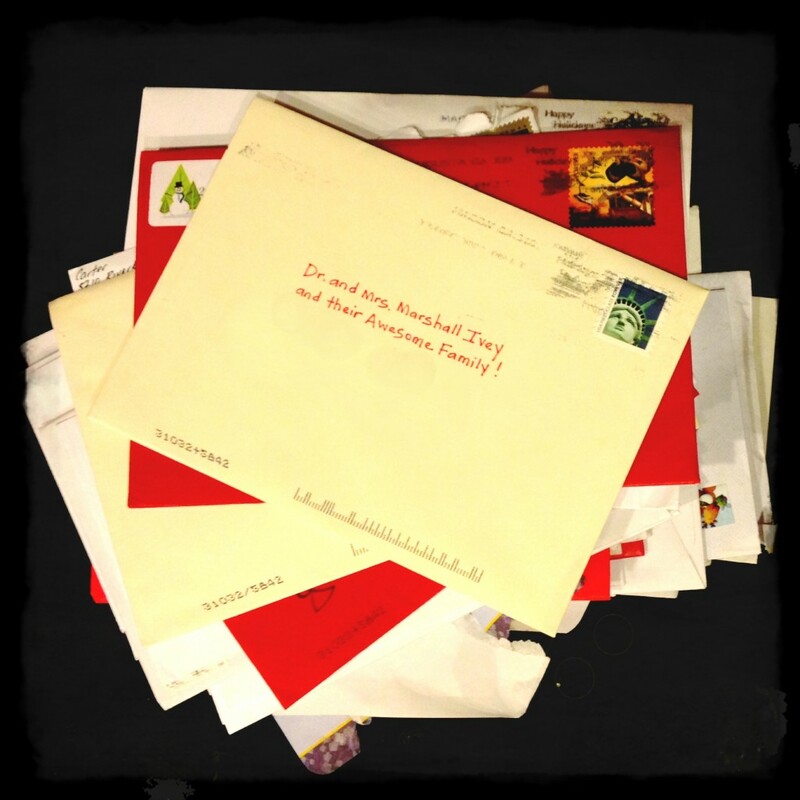 I’d just respond individually to each card we received. I sat down the next day and wrote three cards. And then I used real!stamps! and went to the real!post!office! and mailed them. I told myself that I’d write 3 a week, which would allow me to write back to all of our card senders in a decent amount of time. One problem: with the novellas I was writing, three a week simply was not happening. So I decided to set my goal low and anything else I completed was a bonus! One card a month. SURELY I can do one card a month, I thought. I mailed one card each in February and March. But if I really am going to write back everyone, it’s going to take a lot more than one card a month! And I started to get a little discouraged because I realized I would never complete my plan. 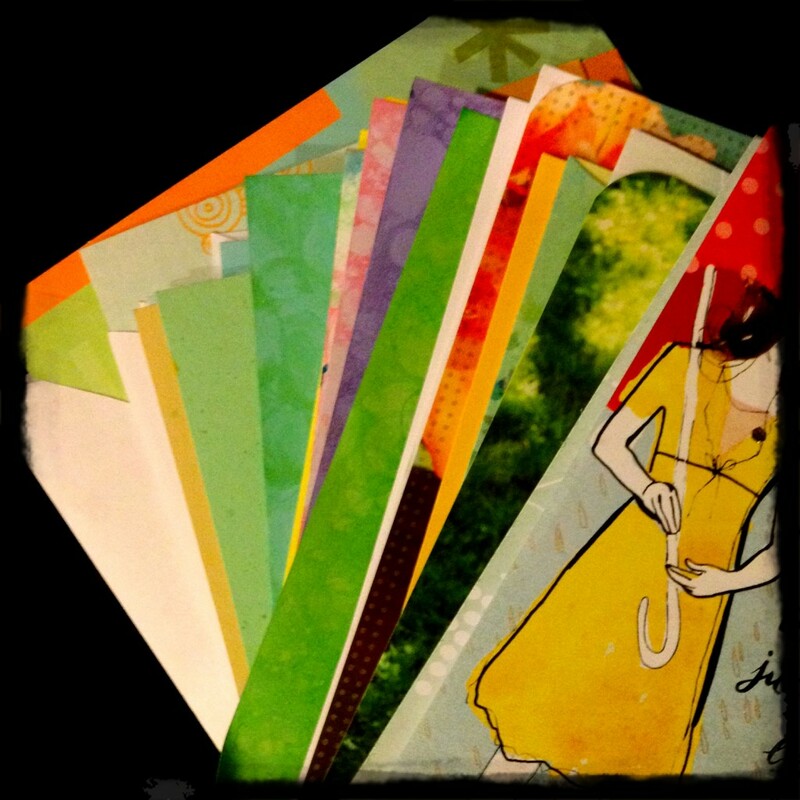 But yesterday something happened that gave me the umph I needed to send more cards. I found all of these in my mailbox! See? Each of those cards had a line or maybe two of a handwritten note inside. And it all of a sudden dawned on me that I didn’t have to write a book – just a few lines. So I pulled out my stack of cards – some homemade, some store bought – and started writing. There are a few of you who should be getting cards in the next few days! This post was written in conjunction with Hallmark’s Tell Them campaign. Visit them on Facebook and take your vow to Tell Them what they need to hear. 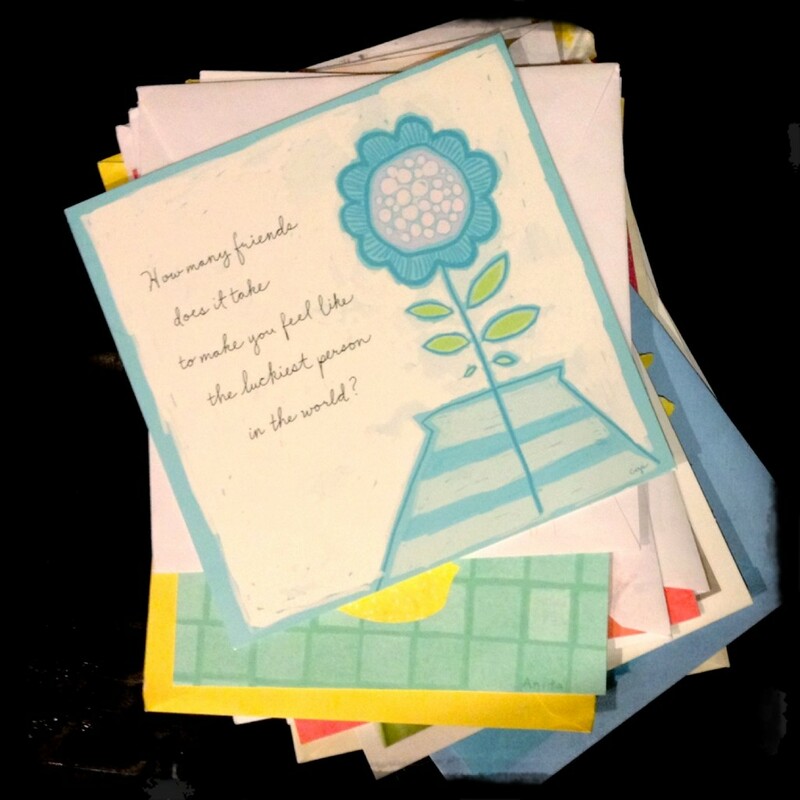 To help one of you Tell Them, I’ve teamed up with Hallmark to giveaway one 10-card pack. No fancy click-here-do-that-now-do-this entries, just leave a comment below telling me what you’d tell. All entries submitted before midnight on Thursday, April 5 will be eligible. One winner will be chosen at random and notified via email. Winner Tara of Frequent Flyer Family has been contacted! I love sending cards (and receiving them). I’ll admit I used to be a great card sender, but in recent years I’ve totally slacked. I really need to get back into my card sending habit, because I know how great it feels to get real life snail mail, the not asking for money kind!! I would tell a friend just how important she is to me! I love sending cards! I use to,((before the 4 kids) send one out to everyone for every holiday. Then when we had Peyton I would send one to his little friends full of stickers and confetti! I remember when I was a kid waiting for mail and being so excited when I finally got a Highlights magazine! I would tell my best friend how proud I am of her. Seeing my children get excited about mail has reminded me how great it felt as a child to get REAL mail….i havent always sent cards like I should….i keep telling myself that i’m gonna keep track of birthdays better & do the card thing. I’d tell him I love him. I’d tell her I miss her. I’d tell her I wish I could be more present and be more supportive. I’d tell them that they’re going to make it…it’s going to be okay. I’d tell him I’m unbelievable grateful he’s in our lives. I’d tell her thank you thank you thank you. I love cards. It’s really a sickness, I think. I haven’t been good at sending out cards in a really long time. But this might be the kick in the pants to just take the time and drop someone a note telling her how much I admire her. Who doesn’t love getting real mail? !